The market is full of many space heaters to choose from. This will lead to the question, what is the best space heater? After careful evaluation of various space heater reviews, we hope to help you narrow down your search. In the end, the answer to that question will vary from consumer to consumer, but one thing is for certain, you should weigh the pros and cons of each product you think about buying. The truth is, your space should be able to keep you warm and cozy no matter what time of year it is. Whether you want to enjoy your favorite hobby or simply want to be comfortable in a particular room, a space heater is the solution for you. Read on for thorough reviews that will serve as a valuable resource for your future purchase. 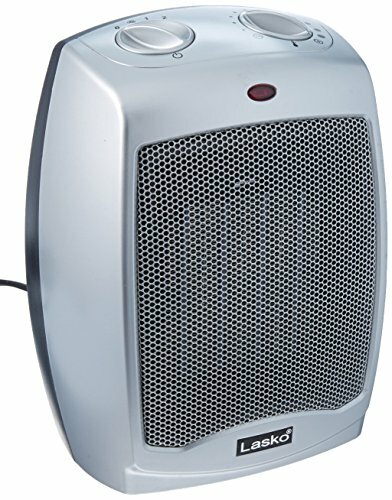 Classified as the best electric space heater on the market, the Lasko 755320 has the necessary features to transform any cold area into a toasty retreat. This product comes fully assembled and the dimensions are 8.5 x 7.5 x 23 in. tall. The digital display and simple one-touch buttons allow for easy use. You can control the heater by choosing a high or low speed setting depending on the type of heat output your desire. Convenience is extended to include a pre-set thermostat and an adjustable 8-hour timer. Plus, there is an additional safety feature that will automatically shut of the unit if it tips over or overheats. You can literally set up this heater and walk away without additional concerns! This completely portable heater is affordable. It is ideal for heating bedrooms, office spaces, or supplemental heat for basements. With this product, you simply can’t go wrong. It is certainly the best space heater for the money! One thing to note, and this is true for all heaters, is that you should take the time to read the recommended circuit requirements for this product. For example, this heater uses 1500 watts and you should take care to ensure that your breaker can handle this type of power before use. 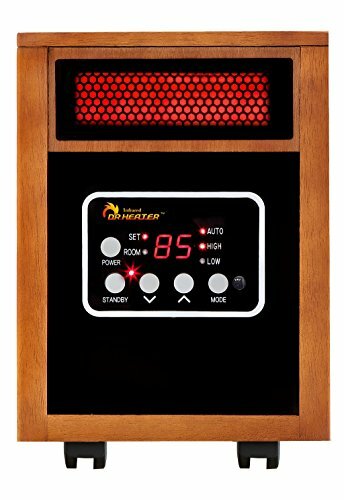 If you are in the market for the best space heater for large rooms, look no further than the Dr. Infrared Heater DR 968. This product is designed to make even larger rooms comfortable enough to enjoy. However, the unit itself is not incredibly large, which makes it an ideal space saver. The specification is 13 x 11 x 16 in. and weighs 24 lbs. This heater can meet the financial requirements of most budgets. Safety was not ignored as there is a built-in tip ovepr protection and an automatic shut off in the case of overheating. The convenient 12-hour shut off means that you don’t have to monitor the unit throughout the day. The remote control allows you to adjust between high and low power while the heaters audibility remains incredibly low. The electronic thermostat ranges from 50-86 degrees which means that you can adjust a needed based on your use of the space. The caster wheel allows you to easily move the unit to various rooms as needed. Many consumers indicate that they are incredibly satisfied with how quickly the space heater can warm up a space. There have been numerous reports that the unit maintains heat and the lifetime filter means little to no maintenance on the unit. It’s important to be aware that some buyers have reported that other remotes can turn the unit on, but is incapable of shutting it off which could be a safety concern. The manufacturer has been notified. This heater is an excellent choice if you are searching for the best small space heater. As you are aware, not everybody needs a heater that can warm large, open spaces, but instead would like to elevate temperatures in considerably smaller rooms. It’s ability to heat small spaces effectively, without using a considerable amount of energy is what classifies this unit as the best energy efficient space heater on the market. The dimensions of the unit are 8.25 x 8.25 x 16.05 in. and the weight is only 10 lbs. The small space heater can be situated in even the tightest places, but the 1500 watts of power make for effective heating. The convenient remote control allows you to operate the high and low temperatures with ease and there is an automatic 7-hour shut off. What’s more is that this space heater actually has a bit of a decorative look to it with a metal scrollwork base and crackled finish. Many consumers appreciate how well the unit blends with their home décor. Plus, you can’t beat the affordable price tag! Keep in mind, while this unit is ideal for smaller spaces, it is not suitable to heat large, poorly insulated spaces. You would do better to consult another option for larger rooms or outdoor areas. You definitely don’t want your sleep disrupted due to incredibly low temperatures. A space heater can certainly help you sleep comfortably and keep your bedroom a cozy retreat. If you’re searching for the best space heater for bedrooms, Lasko 754200 Ceramic is the perfect unit for you. This smaller heater has dimensions of 6 x 7 x 9.2 in. and weighs only 3.5 lbs. However, don’t let the slight size fool you, this space heater can comfortably heat a bedroom with 900-1500 watt setting options. It includes three quiet settings of high, low, or fan only. The adjustable thermostat and handle are a few convenient perks. Plus, there is an automatic shut off feature in the case of overheating. This is the ideal heater if you simply want to warm the area where you sleep. It could be an ideal purchase for a dorm or studio apartment. Customers indicate that are happily surprised at the heating capability, but some reviewers indicate that the product isn’t made with the best material. In some cases, the unit arrived broken or quickly broken after a few uses. The advantage is that there is a 3-year warranty which may offer the peace of mind that buyers need to give this space heater a chance. The basement is certainly an area of the home that usually requires a bit of supplemental heat. Mr.Heater F232000 has been deemed the best space heater for basements because it can adequately heat 225 sq. ft. of space quickly and efficiently. 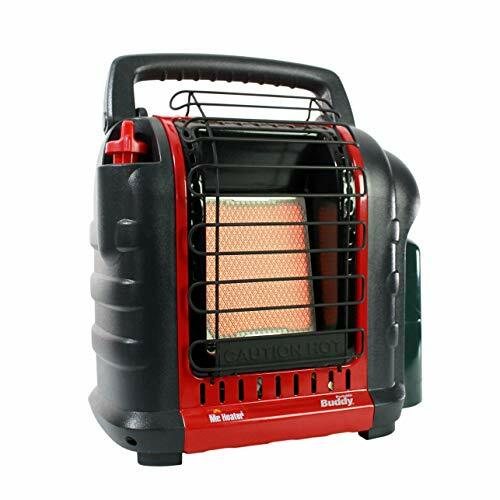 This heater is appropriate for indoor and outdoor use and can also be hooked to propane tank which is not included in the purchase. The dimensions of the product are 14.17 x 8.97 x 14.27 in. and weighs 9.5 pounds. The safety features on this unit include automatic shut off in the event of a tip over, if the pilot light goes out, or if there are low oxygen levels detected within the space. You can rest-assured that safety was a consideration in the construction of this space heater. Consumers indicate that they appreciate that this heater can be used for basements, shops or other outdoor buildings as needed. One thing to note is that is that there is a specific warning that if unauthorized attachments are used with this heater, it can result in serious injury. You’ve certainly been given ample information in this guide, which you can use as you search the market for the appropriate space heater for your needs. As with any purchase, it’s important to weigh the pros and cons of each product to best determine if the heater is right for you. We’ve outlined some of the top heaters in the market to help you best understand the features you should expect in a quality heater. It’s important to evaluate the product in its entirety in order to make sure that you are making the most educate purchase possible. Read on to learn about practical buying tips you can use to help you narrow down the search. In this portion of the guide we will discuss a few buying tips that will help you focus on the best products that are available. Of course, it is your job to determine how each of these points rank in importance, but each point should at least be considered as you scour the marketplace for a quality space heater for your home, office, or outdoor area. Do you need a more powerful unit? If your area is poorly insulated or large, then you will likely need one of the more powerful units that are available. What do you use your space for? This can be a critical component because if you require the space for certain things such as work or hobbies then you will likely want the space to heat faster (thus requiring more power) than the slow, regular heating of a basement or shop. Are you looking at too much power? Just as you don’t want to get a heater that is too weak for your needs, you don’t want to purchase one that is over the top. If your space is small and well insulated, then you should focus on heating solutions that are designed for that type of space. How big is the room you are wanting to heat? If the room is incredibly small, then you will likely want to go with a heater that can be neatly situated in the room without taking up too much precious space. Does the heater fit safely in the space? You definitely want to be sure that the heart fits safely in the area you want it in. Think of whether the heater will be too close to wires or not have access to proper ventilation. Where will be using the heater? If you are using the heater in a basement or outdoor area, then sound may not be as big of a concern. However, if you are using a space heater for your living room or bedroom then you should probably research how loud the unit is when it is set to its highest capability. What type of material is used in the heater? Cheaper materials will likely not hold up to the test of time. This may mean that you will have to buy another space heater after a short time. 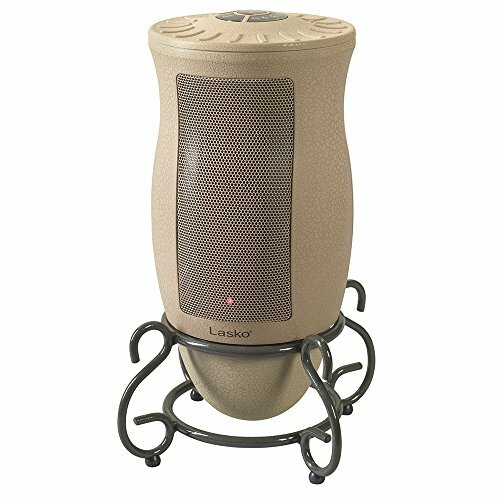 How does the cost of the heater compare to the overall features? The more safety or convenient features impacts the overall quality of the item. Be sure to read through the included features and if that makes it a better purchase in the long run. Does the lower price mean that you sacrifice quality? Make sure that the unit still meets your basic requirements. A lower price tag may not always be worth it. Does the unit come with extra features? It may be worth it to you to pay a larger sum if there are several additional perks with a certain space heater. If the price is higher, consider why. Sometimes, space heaters cost considerably more because they can be used in many different spaces, are equipped with more features, or made with higher quality materials. In some instance, a higher price may mean that the unit will last longer than a cheaper version. Do you plan on using the unit indoors or outdoors? Some units can be used interchangeably, while other heaters are designed for a single type of space. Do you need a multi-use device? Some people prefer a heater that they can use in nearly any space. If this is your requirement, then you’ll want to be sure that the power, size, and capability suit those needs. How will you power the space heater? Most people choose electric space heaters, but there are propane options available as well. Know if you have the ability to heat with the kind you have in mind, or even if you just have a preference between the two. Are people generally satisfied? You shouldn’t expect a perfect rating, but consumers should be overall satisfied with their purchase. Does the brand have a reputation of being helpful? If you have questions about the product or need to use the warranty, you want to be sure that the brand has a reputation of providing quality customer service. Is the brand forward-thinking? By this, we mean does the brand strive to provide only top quality and seek ways to make their product better? Pay attention to the various models available to see if they have taken into consideration improvements that make their products better than the competitor. These tips should be used as a basic guideline as you consider the various products in the market. Think about each point and how much it matters to you. For some, sound may not be as important as the size while other people will really put a lot of emphasis on the brand reputation. No matter which aspect is most important to you, it’s best to critically think about each one to help you make the best purchase. 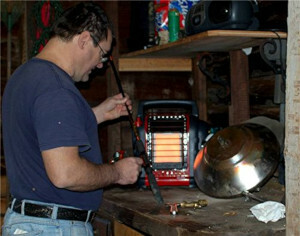 Space heaters are an excellent source of heat for your home, office, garage or workshop. Size, power, durability, price—there are many considerations you will make as you go through each phase of the purchase process. There are a variety of options available which means that you will likely find the perfect product if you take the time to compare the choices that are available to you. The great thing about this type of heating option is that you can finally enjoy a space that perhaps you couldn’t without a quality space heater. Your peace of mind and comfort are certainly a priority as you select the heater that meets your standards. As you can see, there are many space heaters to choose from. The marketplace offers a variety of price points, features, and reviews that may feel overwhelming at first. Keep in mind that a variety of choices simply means that you have a better chance of finding the perfect heater! Still, it can be difficult to navigate the marketplace, and we are hopeful that this information will serve as a valuable tool. It is the intention of this guide to help you narrow down your search and provide insight into how you should research the market for the best deal possible. Space heaters have come a long way in development and safety over the years. Because it is such a durable way to heat, consumers can be more confident in their purchase. As you move forward in selecting the space heater that is right for you, remember that there are key details that can assist you with the process. Take the time to consider what you want out of heater, not just for now, but well into the future. In the end, becoming an informed consumer will increase the likeliness that you buy the space heater that is best for your situation.